Getting in some programming time on my commissioned implementation of Callisto. Honing in on the core bot logic for the computer players. The logic was proving relatively complex but I think I’m seeing the light at the end of the tunnel. Still working on some mid/late game tactical decisions but it doesn’t feel insurmountable. There’s still a significant amount of work left but progress is going well. We met at my house for April’s installment of Analog Game Night. Man, is it April already?! 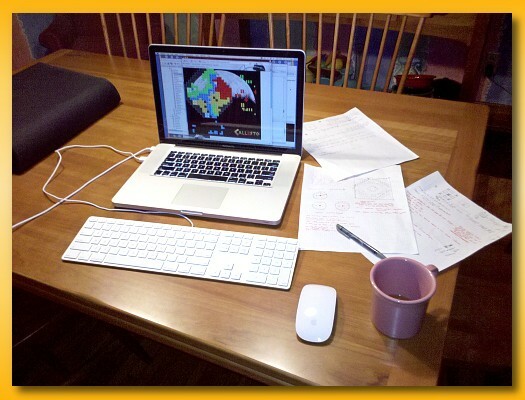 I’ve been totally focused on a couple of side projects that have me, as my wife can attest, relatively unresponsive to much short of a whack to the head. April snuck up on me and, although at one point I had a list of 4 or 5 games I wanted to get to the table, I never managed to get up to speed on them well enough to teach them. While we waited for our sixth to arrive, we sat down for a few rounds of Dixit. Just when we got set up and I began teaching it, our sixth arrived. Although we only played one full round it was, I thought, a nice way to ease into the game night. After much hemming and hawing about what to play next, we decided to play a game of Bang!. Bang! is a game I’ve owned for years and although it was a very early addition to my collection, I’ve never actually played it. As a group, we normally don’t like games with player elimination but in this case we were trying to use it to our advantage. Our plan was to use the first three players eliminated as the selection process for a “split off” group to play a meatier game for three. Unfortunately, it turned out the first three people eliminated were the people who would be the most effective at teaching games so we ended up waiting for the game to end anyway. However, while we waited I did get in a game of Crazy Chicken with one of my fellow dead guys from Bang! After splitting into two groups of three, the far end of the table set up Mystery Express and my end of the table set up Notre Dame. I had great difficulty in teaching the game. Firstly, it’s been a few months since I’ve played (and I’ve only played a couple of times over the years) and secondly, my brain is so shot from staying up too many late nights coding that when I opened the box I almost didn’t recognize what it was. After about 5 minutes of struggling I was able to perceive some clarity of explanation. My two opponents didn’t seem overly phased by my stumbling around but I felt like I was out in left field. I think the far end of the table enjoyed their playing of Mystery Express and I enjoyed Notre Dame. I rarely do well at Notre Dame but I greatly enjoy the pacing of the game and next to zero down time. It’s almost always time for you to do something. Speaking of that, I need to go take a nap…or get out the MacBook and get down to some more coding..z..zz.z.zz.zzzzzzzzzzzzzzzzzz. 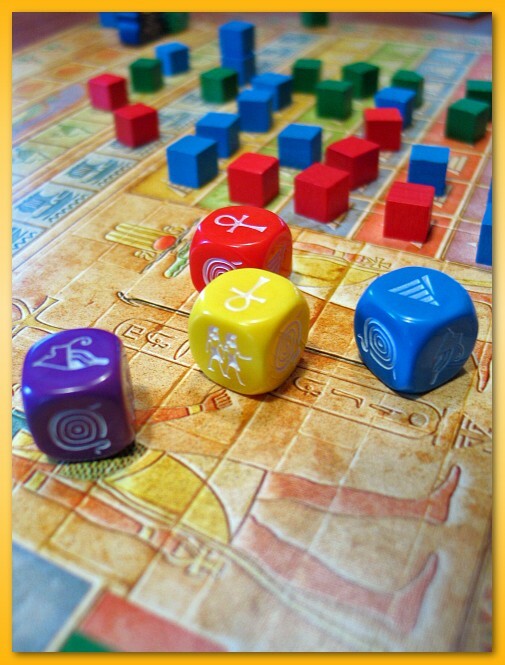 Enjoyed a couple games of Ra – The Dice Game today. Lisa and I played it with only two and it wasn’t bad but I enjoyed it more with a third. I suspect 4 is best. It’s a bit odd without the auction of the standard game but I do like it. It plays fast with little to no down time. Once you get the hang of what dice to keep and how your rolls and the epoch scoring affect your position you can get the turns cranking pretty darn quickly. Watch out for those 4 & 5 sun disasters…killer! Looking forward to more plays.